I put this little backpack on Alvie yesterday. I thought he'd get irritated and want it off. He actually wore it around for an hour and seemed quite proud of himself. It was the cutest thing ever! I think he longs to be like Ashton and go to school. Sorry Alvie you have a few more years to go! What a cutie! What a cutie! I love the little neckercheif too! Alvie gives off such an angelic vibe! And he always looks so clean...Those Taylor boys are very cute!!! Super cute!! 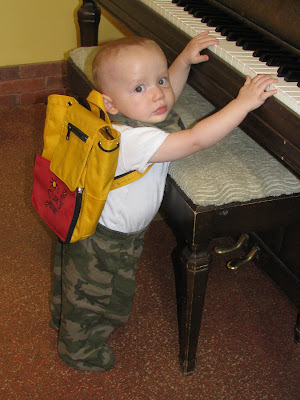 I think Alvie also wants to be like his daddy (already playing the piano...). Very cute- I miss him and Ashton! You should definitely try to come visit next month. We could take them to the beach! He is so cute and a happy baby. And my boys love him. Your little guy is so cute! 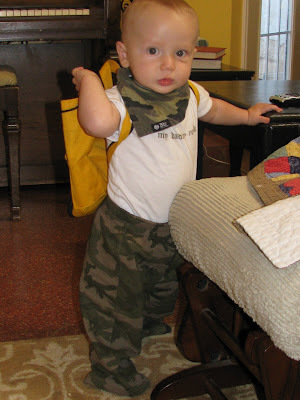 How did you ever get that backpack off him? I must admit I took a peek at your blog a while back from Alesi's. You have such cute kids. I'm glad you said hello. I would love to add your name to my blog list also. Us mama's need to stick together especially when we are always with these cute little ones! :) Take care and I will see you soon. I love the backpack Alvie! Malia knows how you feel... she misses Taliana and Ammon when they go off to school. But... I love it because it is the best bonding time I have with Malia. Is he getting ready to walk?? Hey big guy...you look soooo cute! I am so glad i get to be here to see you grow up...I love you heaps!! Sarah...i tried to leave a comment on Liza's pg but couldn't access it. Will you give her my e-mail address? By the way, thanks for the peach cobbler, you make the best!!! Funny, that i am writing this while you are upfront watching TV. See ya! What a cutie!! I bet he miss's his bro when he is gone. How are ya? I missed Bunko last week, did you go? It has been so crazy lately! I hope everyhing is going well 4 you and the family. Tell Shawn I said HI. Missed you at Bunko! Alvie is a cutie for sure!! Stinking cute! I adore and love you cute mom that you are. let's for sure plan a cali trip. we are all for it! just let us know. He is getting so big!! Call us we miss you. Micah is sure you hate us. Da Da Da Dees! I know it's been forever. Like since your baby shower. Your kids are so cute. We live in Eagle Mountain just west of Lehi. Jesse got an apprenticeship job here, so we will be here at least until he finishes school. Let me know if Seans band ever plays up here. We would love to go. Sarah... I just read Jennifer's blog. I have to say that WE (Shelly, Jennifer, and I) got lucky in the "in-law" department. We couldn't have asked for better sister in-laws as you and Alesi are. We love you! He is so dang cute. I love your boys. 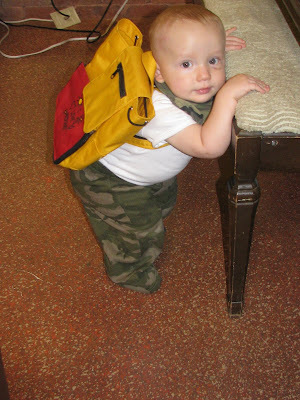 I bet before you know it he will be going to pre school! Hey Sarah- Cute little baby! My two youngest love to wear backpacks, too. It's so fun to find you Reed girls. I've had a fun afternoon reading what you all have been up to. Stephan and his wife have a blog too, check it out. It's in my list on my blog, I don't know how to send you a link so you'll have to look it up. Yeah it's the Taylors! I love your blog, even if some of the cute things you do (green paint) make me feel like Im not doing enough fun and spontanious things with my kids. You've just been tagged. Check my blog for your instructions. Sarah you have been tagged... go to my blog to get all the rules! Sarah I insist you update your blog. This is ridiculous!! I'm missing a Taylor story and I need new pictures of my nephews. I agree with Eliza! Give us some goods! I do love the new background though! Where have you been sista! We missed you last night again at bunko!! Sarah freaking Reed!!! I can't believe I found you! It's Heather Guilkey from the good old days at Sally's. I was doing a little of the old blog-stalking and I came across your page. I am beyond excited to see that you and Sean did indeed get married and that you have such beautiful boys!